So maybe TECHNICALLY this restaurant is a chain, which isn’t what my blog is about, but Blue Sushi Sake Grill in downtown Denver is good. Like good enough that it can turn anyone skeptical about fish into a sushi craving freak. I ate sushi probably five times the next few weeks following our visit to this restaurant. I don’t even like sushi very much – correction – didn’t used to like sushi very much. This is partly because 1) I’m weird about food textures and 2) my freshman year of college when I was at sushi with my roommate and another friend they said they’d pay for my meal if I ate all of the wasabi straight. I did, they didn’t pay and later I felt sick. Thanks for that, Kristina and Paige. Anyway, grudges aside, for some reason Blue Sushi Sake Grill was the sushi experience that changed my tastebuds. A small group of us were in Denver for Pure Barre training this fall and decided to head there for the sushi happy hour. It wasn’t my top pick, but I wasn’t going to be the girl to deny the other instructors their sushi. 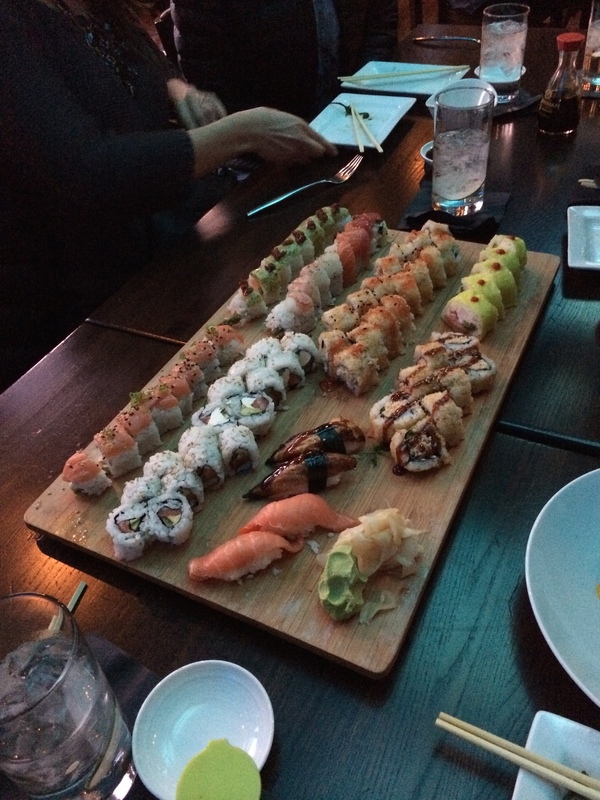 Because it was happy hour, many rolls and appetizers were discounted greatly so we ordered a lot. I’ll start off by saying the Mango Crab Rangoon were delicious but little. It came with six (I think), and they were tasty but probably only meant for two people to share along with a full meal. They had mango and mirin purée and came with a fire-roasted red pepper sauce. So good. I’d never had Shishito peppers so had nothing to compare those to, but they were cooked with garlic, soy and butter and were probably the first thing to be gone from the table. I didn’t taste the Shrimp Tempura however I was told it was good. Being the sushi sissy that I was (I’ve become more adventurous the past few months), I went with a simple Philadelphia roll and the Hawaiian Roll. My main issue when I order a Philadelphia roll is they tend to have way too much cream cheese, but this one had a perfect amount. Enough to get the flavor but not so much that you felt like you were eating an overspread bagel. The real winner of the meal was the Hawaiian Roll. Oh my gosh. It was salmon, crab and mango, tempura fried and topped with the same mirin mango purée from the crab rangoon. I wished I would’ve just had two orders of this. It was probably one of the best things I’ve ever ate. It changed my sushi soul forever. One of the best parts of the meal was the affordable price because of Happy Hour. Sushi can get expensive when you begin ordering more complex rolls. Add in an appetizer and maybe a drink and you could very well spend $40 each on a meal. With the happy hour, that’s not the case. The maki rolls on special were $4.50 a piece, specialty nigiri was $4, specialty sashimi was between $5 and $9, and most starters ranged from $3-5. Super affordable. Blue Sushi Sake Grill’s happy hour is3 p.m. to 6:30 p.m. Monday through Saturday, noon to 8 p.m. Sunday and 10:30 p.m. to midnight on Friday and Saturday nights. I’d make the drive to Denver just for this place.